I have a long list of books I know I should read and want to read. So I gave myself the task of reading one of those books I’ve been meaning to read in 24 hours. 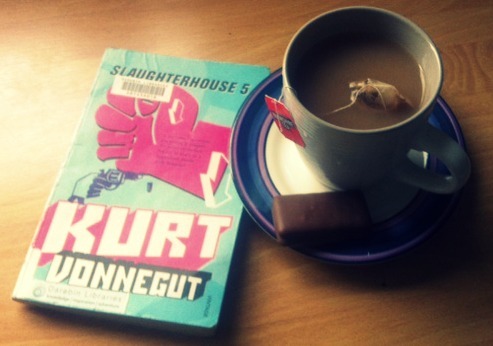 My book of choice was ‘Slaughterhouse Five’ by Kurt Vonnegut which I have been wanting to read ever since I saw it on a banned books reading list published by Shortlist Magazine. Earlier this year I read The Universe Versus Alex Woods by Gavin Extence; a pretty good book once you get into it. In it the main character starts his own Kurt Vonegut book club! Which brought Vonnegut to the top of my reading list. Now I had no idea how long Slaughterhouse Five is, so I was pleasantly pleased (and relieved) to find it was a pretty slim size when I plucked it from the library shelf. The next 24 hours consisted of me reading whenever I could – on the tram, on my lunch break, at the gym on the recumbent bike looking like a douche, but mostly in my bed with tea. I don’t want to give a book review, but I will say I did enjoy the book which reflects Vonnegut’s own personal experiences during WW2 by mixing it with some alien abduction and time travel. (Yep, it’s as odd as it sounds). It’s written as more of a commentary rather than a story and I am sure a lot of the satire went over my head but I appreciated the parts I did grasp and Vonnegut’s unique style. All in all a pleasant, tiring, 24 hours and I am keen to read some more of Vonnegut’s work. So it goes.